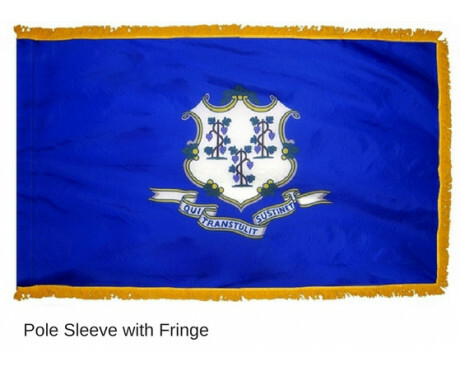 Connecticut was the fifth state to join the United States of America, but the Connecticut state flag is not nearly as old as the state. 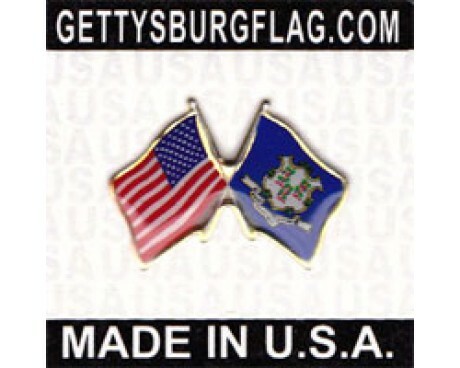 The state was more than a century old before it adopted its flag, although the emblem that is on it is significantly older and refers to the oldest part of the state's history. 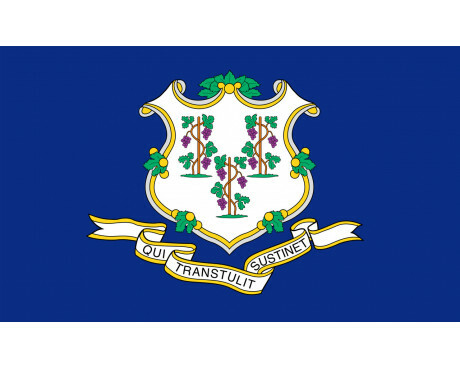 The state flag of Connecticut has a solid blue field that displays a white shield that is decorated with oak leaves and acorns that displays three grape vines above a ribbon that features the state's Latin motto. 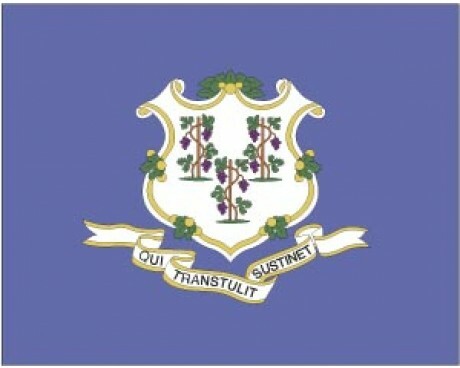 The emblem came from the state's coat of arms, which used the grape vines to represent the three oldest towns in Connecticut, which were Hartford, Windsor, and Wethersfield. Some sources also say that the three vines represented the three colonies of Saybrook, New Haven, and Connecticut, which eventually merged to form the state. The Latin motto is "Qui Transtulit Sustinet," which can be rendered in English as "He who transplanted still sustains." Grape vines were chosen to represent the three settlements because grapes were seen as symbols of peace and good luck. The vines were a natural addition to the grapes, both because grapes grow on vines and because they were considered a symbol of friendship. 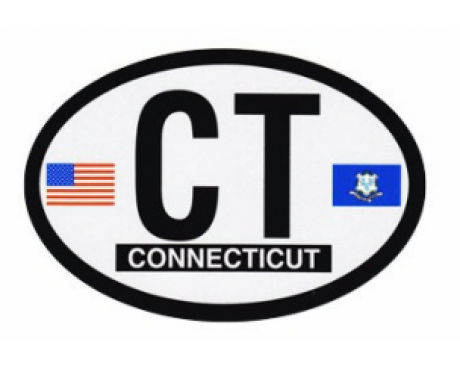 The history of the Connecticut state flag begins with the colony of Saybrook and its coat of arms. The Saybrook coat of arms was adopted to represent the colony in 1639, and it began to represent Connecticut when the two colonies merged in 1644. The original coat of arms had fifteen grape vines instead of the three that can be found on the modern flag. The government of Connecticut changed the design in 1711. It rearranged the words in the state's motto at the same time, but the change did not actually alter the meaning of the phrase. 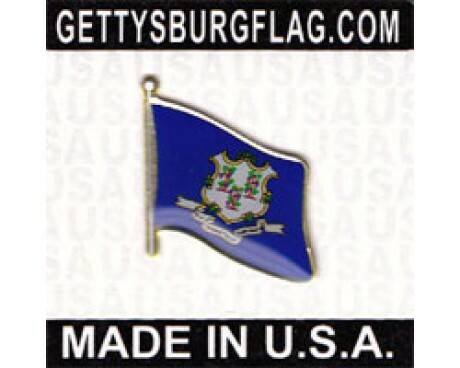 The government of Connecticut decided that it should have a flag of its own in 1895. It appointed a committee to choose a design on the same day that the matter was proposed, but the committee needed two years to reach a decision. 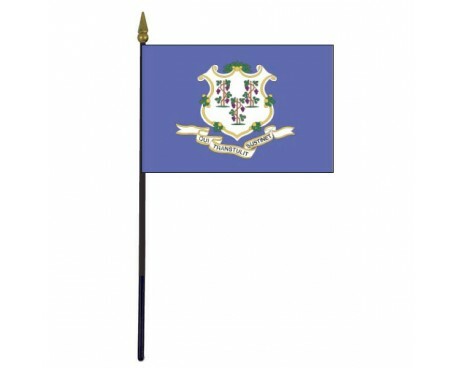 The state flag of Connecticut was formally adopted in 1897, and it has not changed since that time. Connecticut troops used this seal on their flag during the Revolutionary War against the British in 1775. It is among the most ancient of American Flags. The words of the seal were changed around which was adopted in 1931 and is used today. First settled in 1634, and five years later adopted its first constitution. The colony received its first Charter in 1662 after the take over of Saybrook in 1644, and New Haven in 1662. In 1776, it became a republican state, and in 1788 ratified the U.S. constitution.